Taiwan’s parts suppliers in the furniture industry mostly depend on persistently solid market demand for office furniture. In the OA furniture parts sector, Taiwanese makers' attention and devotion to R&D and quality have helped to sustain their businesses for the past few decades. Interviewing the following three OA chair parts makers confirm an inextricable link exists between their gung-ho attitudes toward product innovation and quality, the future and current achievements in the line. One supplier succeeding in carving out a niche with its adjustable lumbar support for OA chairs is Chern Shing Top Co., Ltd., founded in 1987 in Chiayi County, southern Taiwan. Having first focused on making auto parts for 10 years, Chern Shing then diversified into making adjustable lumbar support and related accessories for OA chairs, which have been the biggest contributor to its turnover, as well as being officially recognized by the Central Trust of China, a unit under Taiwan's Central Bank in charge of government procurement. Heidy Liu, director of overseas sales, noted that developing lumbar support for OA chair users was inspired by its experience in auto parts. Makers of car seats tend to pay considerable attention to lumbar support design. So Chern Shing redesigned the auto seat lumbar support to suit OA chair users, creating a series of manually and power adjustable models. Made of special nylon and featuring ergonomic design, the company's adjustable lumbar support firmly supports office workers' lower back, a much needed feature of OA chairs. With the nylon specially treated for durability, these lumbar supports have been tested by SGS to withstand over 100,000 bends, making them structurally stronger than competing models, according to Liu. The newest models are the SB and CH series 2-in-1 adjustable lumbar supports. The SB series support waist and feature built-in height and arc adjustment via turning the control knobs, which come with copper threads for longer durability and easier operation. The upgraded SB is the CH series, also featuring height and arc adjustment, which are available in two models, providing additional support for either the neck or two sides of the waist, according to Liu. Plus, the company has recently developed another model with thigh support. Due to the specialized nature of adjustable lumbar supports, Liu states, Chern Shing hasn't felt significant shipment declines amid the recent global downturn. “Increasing orders from emerging countries, especially South Korea, prop up our business operations very well,” she says. “For OA chair makers, building functional accessories can enhance added-value in products.” With the two new series on its shelf beefing up added-value, the company proves such practice actually makes the segment relatively recession-proof. Established in 1985 in Chiayi County, Tung Yu O.A. Co., Ltd. has also built a solid reputation in the OA furniture sector with some 20 years in developing and producing chair adjustment mechanisms on the OEM and ODM basis. Because no furniture parts makers in Taiwan could produce chair adjusting mechanisms (the metal structure under seats that enables adjusting seat height, seatback tilt etc.) some two decades ago, Tung Yu, with the help of its foreign clients, hence was determined to be the first. Such single-mindedness has paid off: Tung Yu, after years of devotion, now leads the sector by export volume, value and domestic sales. Tung Yu runs two production plants each in Taiwan and mainland China. Also, the company has reinvested in a stamping factory and contracts several surface treatment companies with world-caliber electroplating lines, aiming to complement its production capability and product quality. In short, no one on the island is on par with the company in integrated and flexible production in the sector. Tung Yu's general manager Johnson Lin indicates that his company supplies a full range of adjusting mechanism for nearly all kinds of OA chairs, from the low to high end, adding that its strong R&D backbone props up the company steadily amid the global downturn. The newly launched SN-8940A2 series chair adjustment mechanism underlines the company's R&D capability, featuring an improved tilt function which helps to provide a comfortable sit of OA chairs Besides, the mechanism also enables four-stage locking positioning, assuring convenient seat-back tilting that outperforms competing models. However, Lin says, the company's mechanisms are a big hit with OA chair makers for their exterior design, which feature aluminum alloy housing with silver finish, geometric form and comfortable touch, which enhance the overall aesthetic integration with OA chairs. “Aside from functionality, making chair adjusting mechanisms look a harmonious part of office chairs is a growing trend in the sector,” he adds. The global financial fallout and ensuing recession has not dampened Lin's optimism about business operations as much as other corporate managers, he says, “despite contract orders shrinking, around 2 million chair adjusting mechanisms are still in demand every month in the Asia Pacific alone.” And such enormous business opportunity, he believes, can only be fully tapped by suppliers backed with substantial production and R&D capability as well as and keen sense of product quality and design. Proving that making minimal functional and exterior design improvements can result in significant upgrades of even seemingly mundane parts as chair armrests is Chuan Hsing Chemical Industry Co., Ltd., whose earnest dedication has helped to gain solid ground in the segment. Since its establishment in 1974 in Taichung County, central Taiwan, Chuan Hsing has tapped its knowledge of industrial plastics, including PU (polyurethane), nylon and PP (polypropylene), to engage in R&D and production of chair armrests. The company's products are widely used as OE parts by major global brands of mid-to-high-end OA chairs, a testament to the maker's quality and functionality. Citing the newest CH630 series OA chair adjustable armrest, Tsai points out that the series has improved mechanical structure that is smaller than before, with less vibration and allowing lateral adjustment. Also, the company optimizes the design simplicity of the mechanism to virtually eliminate production failure, hence enhancing production efficiency. Besides, the armrest has an innovative triangular body of plastic and aluminum alloy, which helps to minimize size and yet enhance aesthetics, a feature that helps to raise added-value in the high-end segment. 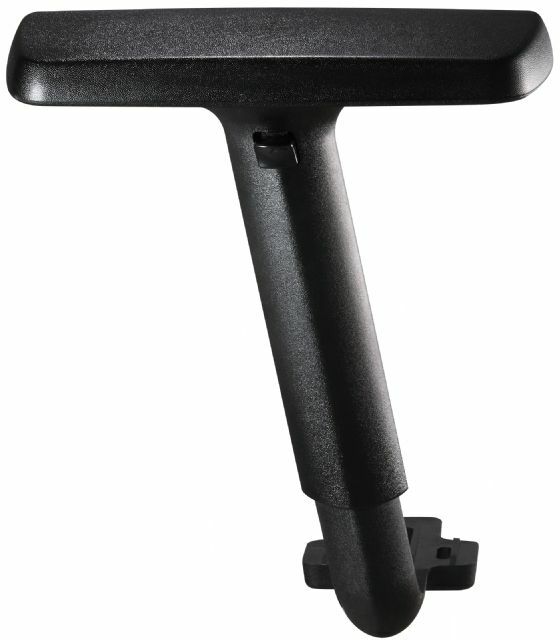 Featuring a universal connector, the armrest can be installed with the company's PU ergonomic pads to fit most OA chairs in the market, according to Tsai. Trying to be green amid growing global sensitivity for ecological health, Tsai says Chuan Hsing is developing armrests by looking for recyclable materials as alternatives to PU. The maker is also working on redesigning armrests with modular parts for easy disassembly and reuse,” he says. Such efforts are signs that Chuan Hsing, undaunted by the sagging world economy, is determined to hold its ground.